Legend has it that, back in late 1964, Jim Henson and his Muppet troupe (performer Frank Oz, puppet builder Don Sahlin, and writer Jerry Juhl) were booked for a guest-spot on Tonight Starring Jack Paar. This was the period, before Sesame Street, when the team made their living via variety show appearances and commercials. Henson and friends arrived at NBC at 10am for a rehearsal and were told that they wouldn’t be performing until 4pm. With lots of time to kill, Oz opened a utility closet door in their dressing room and found essentially a wall of dusty, black pipes. Henson and friends signed their work “with LOVE from the Muppets” and closed the door. The following week, Paar brought a camera backstage to show the home viewers what the Muppet gang had done. As a joke, Henson had written, in small lettering, “Represented by William Morris” (his agency at the time). The Paar Show people painted over that before putting it on the air. 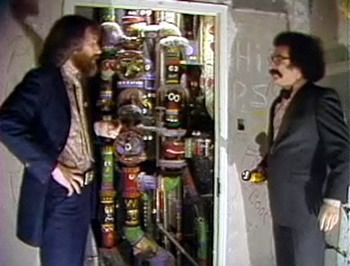 Henson was told that the pipes were very nice but they’d be painted over the next day. Since it had been a lark, he didn’t have a problem with it. For whatever reason, the pipes were not destroyed but they were largely forgotten and eventually sealed away. In 1984, Paar appeared on Late Night with David Letterman and brought the host backstage to proudly show him the pipes. In 1993, the area was redone for Late Night with Conan O’Brien. The pipes were located in Max Weinberg’s dressing room. In 2009, Jimmy Fallon began hosting his own late-night show and displayed the pipes on a satellite interview on The Jay Leno Show. Fallon encouraged NBC to make the pipes a part of the official NBC tour. Recently, anchor Brian Williams brought Oz back NBC to show him the pipes and he was obviously a bit moved. As Oz noted, of the four men who created them, he is the only survivor. Later, Oz returned to the pipes with Fallon for a ribbon cutting on the Today Show. The Jim Henson part of the NBC tour is now open. What do you think? 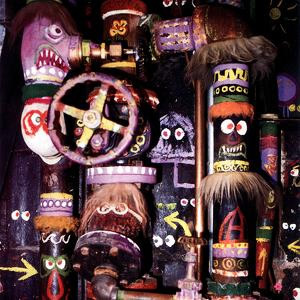 If you were in New York, would you want to go see “The Jim Henson Memorial Pipes”? Last Call with Carson Daly: Is the NBC Series Doomed to be Cancelled? Great piece! Henson is an unrivaled genius. I’d certainly go see the memorial. I always follow the Muppets for any upcoming projects, too.